On its 51st anniversary, the Philippine School of Interior Design (PSID), will mount “JUXTAPOSE”, an interior design exhibit exploring Adaptive Reuse as a solution to design problems. The graduation exhibit will be held on October 1-31, at the penthouse of the Santolan Town Plaza in San Juan City. Adaptive Reuse is the process of reusing old buildings or sites for a purpose other than which it was built for. The PSID 2018 graduating batch will take the challenge of marrying the past and present with designs that breathe new life into historical spaces. Co-presented by Rockwell, in partnership with the National Commission for Culture and the Arts (NCCA), and mounted in cooperation with All Home, Boysen, Fyrelynn Industries, Habitat, Ilaw Atbp., Larry’s Curtains, Matimco, Schema, Tierra Plants, and Toto, the 17 well thought out booths challenge the audience, proponents of the conservation of cultural heritage, and developers to find creative solutions in the restoration and rehabilitation of historical structures. JUXTAPOSE seeks to help Filipinos further understand our cultural and historical identity. Students of the PSID Advanced Class of 2018 will bring together elements from both the past and present for a new, innovatively designed space. JUXTAPOSE will walk the audience through three galleries: “Tahanan”, “Pangkalakal”, and “Pang-industriya”. 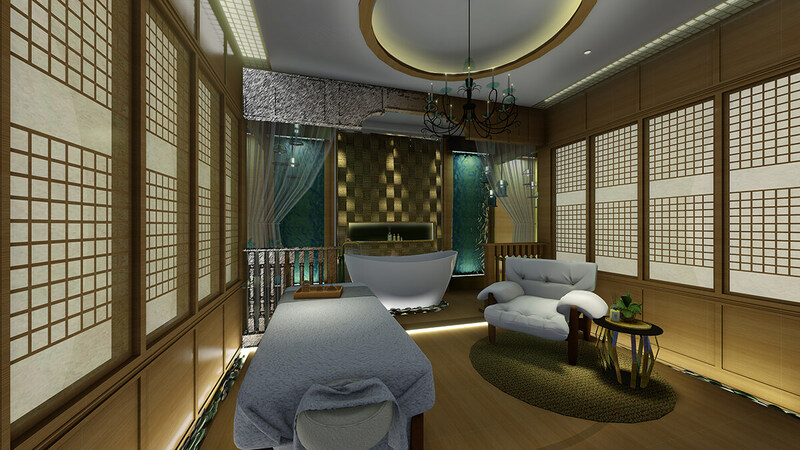 Focusing on residential buildings like the iconic “Bahay na Bato”, the “Tahanan” gallery will feature booths such as “The bar beneath…in San Juan”, “The Vigan Atelier”, “Small Space, Big Living”, “Modern Filipino Haven”, “Bridal Boudoir”, and the “Marahuyo Spa and Tea House”. Booth 2, The Vigan Atelier by Donna Causapin, Nikka Merro, Lara Ong, and Ana Roble. 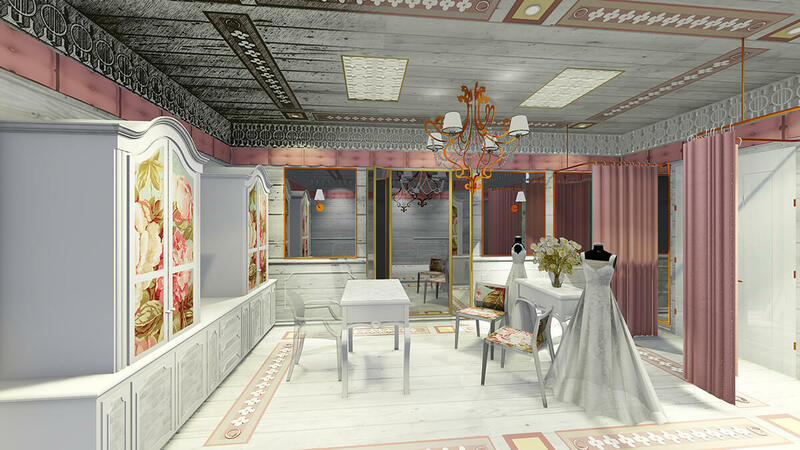 Inspired by the Cabildo ancestral house in Calle Crisologo, the intricate callado patterns on the lighting fixtures and flooring celebrates the beauty of the space’s historical culture while the soft pink hues of the wall borders and curtains inject youthfulness to the design—a space made for an outstanding Filipino couturier. Booth 4, Modern Filipino Haven by Kristine Escober, Pam Lachica, Mary Justine Teng, and Kim Tigue. Taking cues from the Laurel Ancestral House in San Juan City, this private spa relies on the balance of different design elements to create an environment that engages the senses—neutral, earthy colors with warm mood lighting that captures the sense of sight, the mixture of natural wood, textured glass, and metals excite the sense of touch, while the aromas captivate the sense of smell. Meanwhile, the “Pangkalakal” gallery showcases booths reminiscent of the streetscapes of Escolta and Avenida Rizal’s commercial streetscapes like the “La Moneda Bookshop and Café”, “CC Café + Creatives”, “Little Café Museum”, “Café 308”, “Kusina Aduana”, and “Below Zero Gelateria”. Booth 7, La Moneda Bookshop and Café by Alexis Casas, Kristine Jaspio, Lauren Laudico, and Hannah Tan. 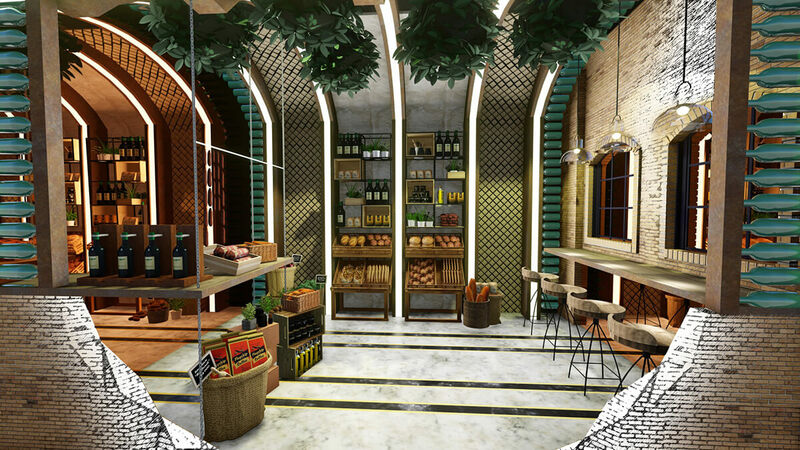 This adaptively reused design takes inspiration from the history of the Aduana Building as the Mint House or Casa de Moneda, where the first Philippine coins were made. To echo this pivotal moment, the overall design of the space reflects the lustrous shine of the coin—from the unique artwork showcased against the coin wall to the copper and metallic touches in the fixtures and fabrics used. Booth 12, Below Zero Gelateria by Rein Emmie Dela Cruz, Elaine Hiloma, Gwency Sobrepeña, and Denise Tuazon. 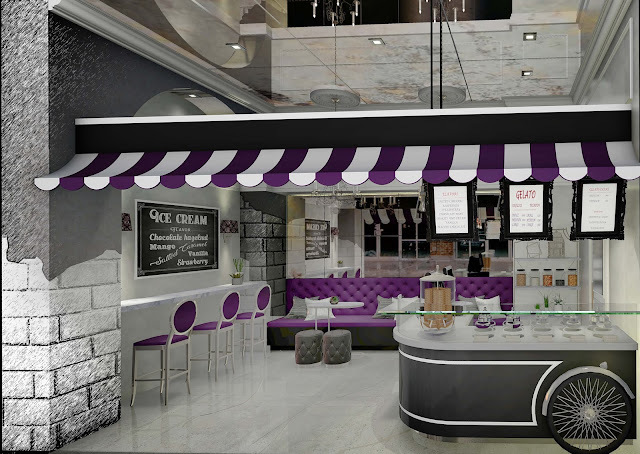 The use of polished concrete for the walls and floor while retaining the exposed bricks that mimic the remains of the old Aduana Building, this Gelato Shop is a vision of subtle sophistication with a hint of simplicity. The antique mirrors on the ceiling with tufted upholstered furniture pieces complete the classic, elegant, and vintage ambiance of the space. The “Pang-industriya” gallery highlights design solutions for old industrial sites as will be demonstrated in the booths “Fit Street”, “Dor-Moderno”, “Station No. 15”, “Polo Estacion”, and Gentleman’s Barber Lounge. Booth 15, Station No. 15 by Sophia Aguado, Alecsa Alcantara, Naomi Estiva, and Rani Lorenzana. 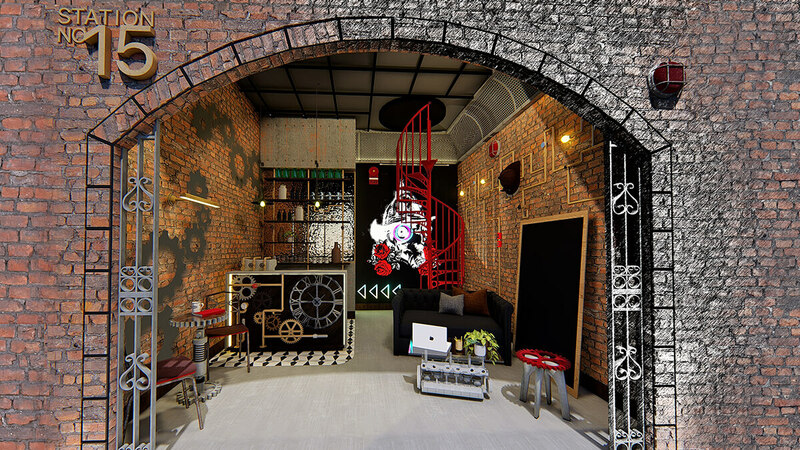 A co-working bar featuring accents inspired by the steampunk genre, the redesigned old Tanduay Fire Station’s storage room redefines the curbs of Manila and serves a new purpose to the modern Manileño. Booth 16, Polo Estacion by Carleen Choi-Kua, Cherrie Ferrer, Judith Pauline Guiang, and Ma. Kathrina Reston. PNR Polo Station is envisioned to be redesigned into an artisan market and local wine shop showcasing the region’s local produce and goods. Brick walls, arch windows, and a standalone ruin were retained to keep the space’s integrity while modern and local elements of bronze mirror, steel, illuminated acrylic, capiz and a careful selection of furniture and accessories create the rustic contemporary meets industrial design. Through these three galleries, current interior design concepts such as bed and breakfast inns, AirBnB hostels, co-working spaces, and others are ways in which otherwise forgotten historical structures are brought to life once again. 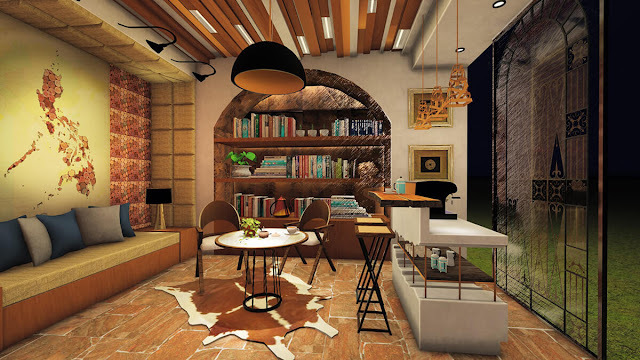 “Tahanan”, “Pangkalakal”, and “Pang-industriya” will serve as inspirations for practical, game-changing interior design solutions, creating a new niche in the concept of Adaptive Reuse.